Last year, Google rolled out authorship markup which displays author information (including a thumbnail image) right in the search engine results pages (SERPs). It can be extremely powerful and can absolutely make your content stand out. For example, here’s what a search result looks like for my post about bounce rate and exit rate. With author details in the SERPs, a thumbnail image shows up for the author, there’s a link to the author’s Google profile (or Google+ profile), and you can link to additional posts from that author right from the search listing. If you are logged into Google+, you can also circle that author right from the search results. This can all lead to higher levels of trust with users, which can lead to higher engagement and click-through. Think about it, if Google is highlighting the author by providing all of the information I listed above, it can bring a higher level of credibility when users are searching for solutions, answers, help, etc. Although authorship markup can yield powerful results, there are some problems associated with it. As many webmasters have found out the hard way, adding authorship markup to a website or blog can be confusing. Google lists several ways you can add authorship markup to a website, which is both good and bad. It’s great to have options, but it leaves too much room for error, especially for non-technical website owners. Also, since you’re never given all the feedback you need to make sure authorship markup is working, it can lead to a flawed (or botched) implementation that goes untouched and unfixed for too long. Google does provide the Rich Snippets Testing Tool, but it doesn’t include detailed instructions for making changes (nor does it always provide clear information). Since Google doesn’t guarantee it will show author details for all markup implementations, you basically have to wait it out and see how the new markup takes. If it takes, you’ll see the robust search listings I showed you earlier. If it doesn’t take, you’ll see the standard listings (all text). Again, not every author is eligible for author details in the SERPs. That’s algorithmically determined. Therefore, you won’t know right away if it’s your setup that’s the problem, or if you just aren’t eligible. As you can guess, this can be very frustrating for webmasters. With the rollout of Google+ business pages, Google added a way to connect your business page with your website (and vice versa). The benefit of doing this is that a company can share +1’s across its website content and business page on Google+. It also makes you eligible for Google+ Direct Connect. 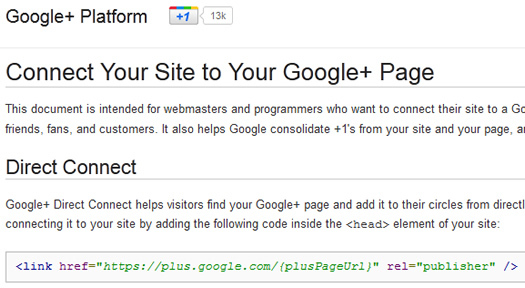 In order to connect your Google+ page with your site, you need to add more code. Google recommends adding a snippet of code to the head of your webpages using rel=publisher. The problem, once again, is that webmasters were adding the code, but never knew if it was implemented correctly. In addition, people were confused whether rel=publisher would work with rel=author? Could the two pieces of code be located on the same page? How would Google handle that? And would it screw up authorship markup? These were all good questions, and again, it caused a lot of confusion for webmasters. So, based on what I listed above, there are definitely webmasters out there who have implemented authorship markup that aren’t reaping the benefits in the SERPs. I know how frustrating this can be for webmasters, since I just finished helping one site fix a botched implementation. The author was at her wit’s end. And she isn’t alone. But don’t fear. I’m going to explain what went wrong so you don’t make the same mistakes. I also hope this post can help you troubleshoot implementations that aren’t yielding the desired results. For example, if the SERPs don’t display author information, thumbnail images, etc. Let’s learn more about what was happening. The site in question had implemented rel=author by linking directly to the Google+ profile for that person (it was a single author blog). According to Google, you can implement authorship markup this way, as documented in their help section about authorship markup. Note: Google just added a new way to add authorship markup, but the original methods are still supported. With regard to the company I was helping, linking directly to a Google profile from each piece of content is easy, but it’s not what I recommend. Instead, I recommend linking to a dedicated author page on your site using rel=author, which then links to a Google profile using rel=me. Then you would link back to your author page from your Google profile using rel=me to complete the process. This three way linkage seems to work best, based on my experience. If you haven’t dealt with authorship markup yet, then I’m sure the last paragraph completely confused you. :) Stick with me, though. There’s a good lesson to learn. Back to the site I helped. So, the site in question was linking directly to a Google profile from each piece of content on the site. Then the Google profile was linking back to the site using rel=me. 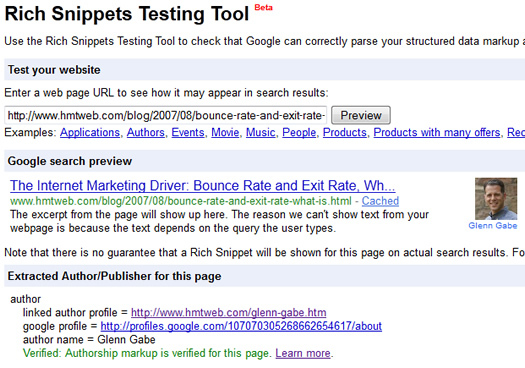 Using the Rich Snippets Testing Tool, the implementation of authorship markup looked correct. Also, for a short period of time, author information did show up in the SERPs (according to the company). All looked good from their end. Then Google+ business pages rolled out and Google recommended that webmasters link their websites to their Google+ business pages using rel=publisher (as I covered earlier). So the site did just that, adding rel=publisher to each page of the site (using the code that Google provided), which was included in the Google help documentation. When testing the pages using the Rich Snippets Testing Tool after rel=publisher went live revealed some strange results. The tool said authorship markup was correct, but the SERP preview showed the business page as the author. Needless to say, that’s not what the author wanted. After the site got crawled again, author details disappeared from the SERPs. Instead, just the typical SERP details were displayed. Note, rankings were unaffected (which you would hope would be the case), but author details, including the beautiful thumbnail image, were gone. Weeks went by and nothing changed in the SERPs. 1) I wanted to remove rel=publisher from each page of the site, other than the homepage. I believed that was confusing Google and could be screwing up author details in the SERPs. 2) I wanted to revamp the way authorship was installed on the site. Instead of linking directly to the Google profile from each page of the site using rel=author, I recommended adding links to a dedicated author page on the site using rel=author. Then, as I covered earlier, the website should link to the Google profile from the author page using rel=me. And last, they should add a link from the Google profile to the author page using rel=me. That’s the three part linkage I mentioned earlier. After implementing the changes listed above, we needed to let the site get crawled again. This took about 5-6 six days. After which, I was excited to see that author details were back in the SERPs! For each piece of content ranking in Google, you can now see all the beautiful SERP details via authorship markup. And yes, it makes a huge difference for the site and author I helped. The listings just stand out. So, if you have implemented authorship markup, while also connecting your site to your Google+ page, then beware of a botched setup. If you believe you should have author details showing up in the SERPs, but aren’t seeing them, don’t automatically assume you aren’t eligible. Some of you might be eligible… I recommend double-checking your setup, having someone familiar with SEO check it out, and then making changes, if necessary. Then it’s just a matter of waiting to get crawled again (which varies depending on your specific site). Based on the rapid growth of Pinterest, and all the buzz associated with that growth, I’ve received a lot of questions recently about how ecommerce retailers could get more involved. Also, website owners want to know the best ways to make it easier for Pinterest users to pin photos that are located on their respective websites. So, I decided to write this post to explain various ways to include the “Pin It” button on a website. I will include instructions and information below for how to include a “Pin It” button on a webpage, on a WordPress blog or website, and how to address adding the “Pin It” button to an ecommerce CMS (which is the most challenging of the three). What is the “Pin It” Button? Before we hop into the instructions, I’ll quickly cover what the “Pin It” button is. You have inevitably seen Like buttons, Tweet buttons, +1 buttons, etc. as you travel the web. Those social plugins make it easier for users to share content to Facebook, Twitter, and Google+ from websites across the web. Well, Pinterest also wants to make it easier for users to quickly pin content. So, they created the “Pin It” button. In its simplest form, it’s a small button that you can place on a webpage that enables users to quickly pin content to a pinboard, while also showing how many “pins” it has received. You can tailor the code of the “Pin It” button to specify the URL of the webpage, the URL of the image you want users to pin, and the description that populates the “Pin It” form. You can also tailor how the “Pin It” button displays on your webpages. Since there are several types of websites, and each brings its own type of installation, I’ll cover a few of the most common methods below. My hope is that the following information and instructions can help you get up and running quickly. Let’s face it, if you make it easier for users to pin content, the greater chance you have of receiving a spike of traffic from Pinterest. Let’s jump in. This is the most basic implementation of the “Pin It” button. Let’s say you have a webpage with a killer photo of your core product. Maybe you don’t have many products, but just sell a handful of core products. If that’s the case, you could use the following instructions to add a “Pin It” button to those product webpages. 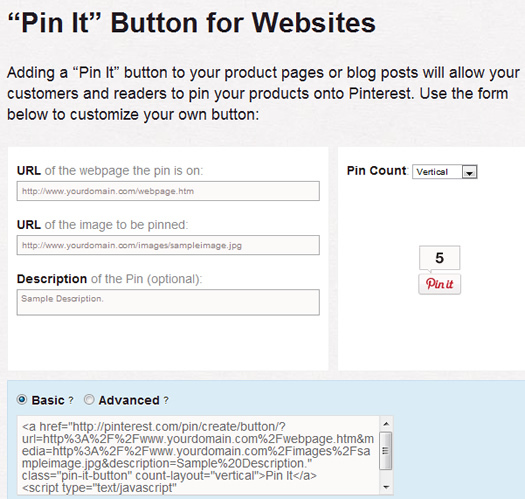 Pinterest has created a simple tool on its website to help webmasters create a static “Pin It” button. 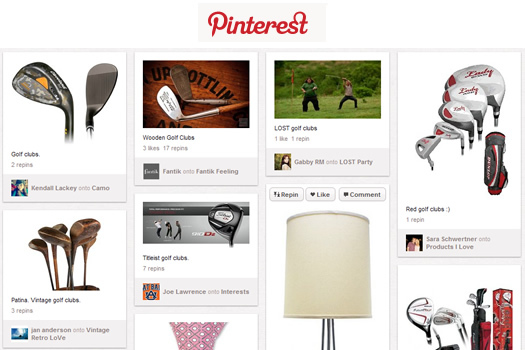 You can visit http://pinterest.com/about/goodies/ and scroll down to section titled “Pin It” Button for Websites. You will see fields for URL of the webpage the photo is located on, URL of the image located on your servers, and then a description field. The description is optional, but I highly recommend adding that to make it easier for users (since it auto-populates the “pin it” form once the button is clicked). You can also select how the “Pin It” button displays. There is a dropdown that lets you choose if the pin count shows up next to or above the pin button. You can also choose to not show the pin count at all. Once you enter the required information, Pinterest will generate the code for you below the form. Then you can copy the code and add it to your webpage. There is “Basic” code and “Advanced Code”. The advanced code loads asynchronously, which can help with performance. Also, you should use the advanced code when you want to add several pin buttons to one webpage. You will need to add the resulting code to your webpage (in your html). If you are running a WordPress blog, you are in luck. There are several plugins that you can install that makes it easy to add “Pin It” buttons to your blog posts and pages. I’ll explain two of those plugins below. The first plugin I’ll cover is called Pinterest Pin It Button, and it provides some great functionality. Using this plugin, you can add “Pin It” buttons to your posts, pages, homepage, archives, etc. In addition, you can choose to show the “Pin It” button either above or below your main content. For even more customization, you can use a shortcode in your post to add the “Pin It” button within your main content. For example, you can use the shortcode [pinit] within your post to add the “Pin It” button within your content (versus just at the top or bottom of the post). The second plugin I’ll cover offers basic “Pin It” button functionality. The Pin It on Pinterest plugin adds a “Pin It” button at the end of your posts, and it enables you to select which image should get pinned, as well as what the pre-populated description should be. Once installed, you will see Pinterest options in your post editor within WordPress. I mentioned earlier that adding a “Pin It” button to an ecommerce CMS is the most challenging to address. The reason is simple. When you have hundreds (or thousands) of products being handled dynamically by a content management system (CMS), you can’t simply add a static pin it button like we did earlier in the post. The code needs to be dynamically tailored based on the product at hand. There aren’t separate pages for each product within an ecommerce CMS, but instead, the CMS dynamically handles each product via database-driven code. This means you cannot simply ftp product pages to your server for each product you sell on your website. The underlying code needs to determine the right URL’s and description for the “Pin It” button. In WordPress, the_permalink() returns the current URL, which can be used to populate the “Pin It” button code. This is the approach you would need to use for your own CMS. The good news is that any reputable ecommerce CMS will provide a reference guide that includes the various functions and variables that can be used. Actually, it’s common to use these functions and variables to perform other tasks. 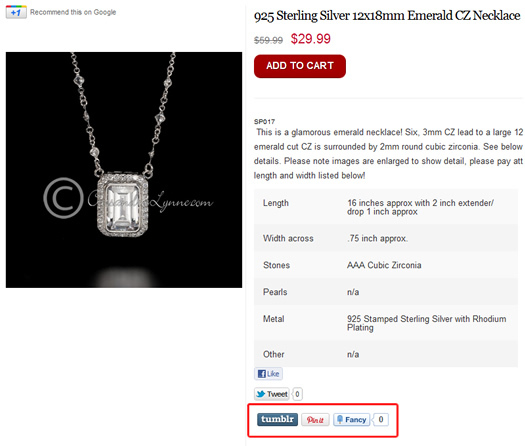 For example, here is a webpage explaining how to add a pin it button to Shopify. You’ll notice that the example includes variables specific to Shopify for determining the current URL, image URL, and description. Again, your own ecommerce CMS provider should provide similar variables you can use when adding the pin it button to your website. My recommendation is to contact your ecommerce CMS provider and track down the necessary code for referencing the current page, images within product pages, and the description you want to use for the image. Once you have that information, you can add the necessary code to your CMS template or theme to handle the “Pin It” button. It will then dynamically pull the correct information for each product page on your website. I hope this post helped you understand more about Pinterest, including how to add a “Pin It” button to your website, WordPress blog, or ecommerce CMS. Pinterest is growing rapidly and adding the “Pin It” button to your website can make it easier for users to share your content. This can give you a greater chance of having that content get noticed, shared, etc., which can result in increased traffic, exposure, and sales. And that’s what ecommerce is all about! In 2008, I wrote a post about how delaying email by one minute in Microsoft Outlook could save your job one day. It’s been a popular post on my blog since then, and I’ve received many emails from people explaining how that tip did save them. So, although I typically write about digital marketing strategy, including SEO, SEM, Web Analytics, Social Media Marketing, etc., I thought I would write another Microsoft Office tutorial. This one won’t save your job, but it sure can save you a lot of time. If your an avid fan of Microsoft Word (and Outlook), then you are going to want to pay attention to this post. 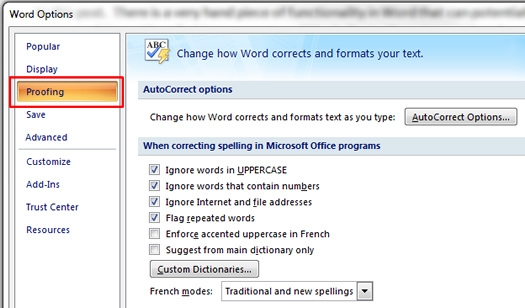 There is a handy piece of functionality in Word that can potentially save you a huge amount of time. It’s called AutoCorrect, and it’s similar to the autocomplete functionality you find in Google Search. Intrigued? I’ll show you how to use AutoCorrect below. 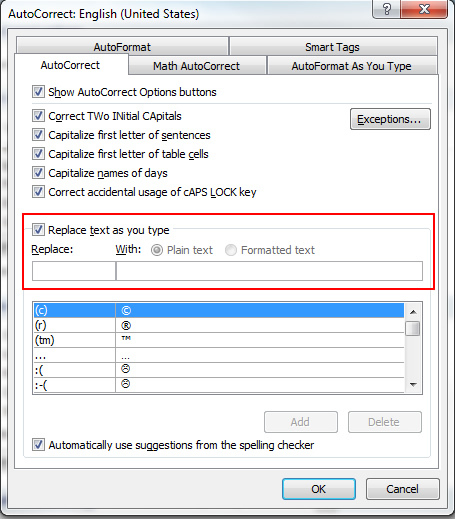 The options for AutoCorrect are buried in an menu in Word. I have no idea why Microsoft chooses to make it so hard to find some of the incredible functionality it has built for its products, but it does. Let’s walk through a quick example of using AutoCorrect below. Note, there is only one minor difference between Word 2007 and Word 2010. I’ll highlight that below when we come across it during the tutorial. Let’s say you run a web site and often answer questions from users about how to find a certain document or product answer. Maybe you frequently write “Please check the faq for more information.” Boy, that can tire out your hands if you were writing that 50-100 times per day. Let’s automate this. 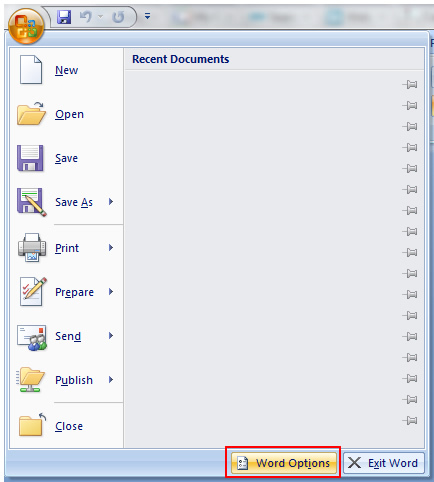 Note: in Word 2007, you would click the round “Application Menu” button in the upper left corner of the Ribbon in Word. Then you would click “Options”. This would take you to the screen where “Proofing would be available”. When the AutoCorrect options show up, make sure the “AutoCorrect” tab is active. Find the “Replace text as you type” option, which is about half way down the options screen. Make sure the checkbox is checked. Now you can enter the shortcut in the “replace” field. This is the text you will type in Word that actually means something else. Then, add the phrase your shortcut will equate to in the “With” field. As mentioned earlier, we are going to use “pcfq” to mean “Please check the faq for more information”. Check the screenshot below to see how this would look. Click “Add” at the bottom of the window to enter your new AutoCorrect phrase. That’s all you need to do in order to set up AutoCorrect. 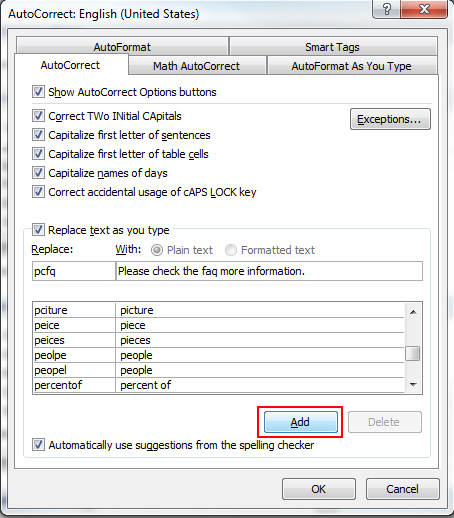 Open a new document in Word, and type “pcfq” without quotes and hit enter. Word should change that to the phrase you entered above. Awesome, right? Think about how much time this will save you. Automating repetitive tasks can help you save huge amounts of time. If you find yourself writing the same thing over and over, then you will love AutoCorrect. Think about it, if it takes you 5 extra seconds to type a certain phrase, and you type that phrase 50 times per day, you’ll save 4 minutes per day (per phrase). That’s 28 minutes per week and 2 hours per month! And that’s only for one phrase.